True confessions. Up until six months ago, I had never eaten pot roast. When I was growing up, my mom cooked a lot of beef because my dad wouldn’t eat chicken. Her dish for home cooking comfort was brisket. This was my sister Jane’s favorite, and she always requested it for her birthday or other occasions when she got to pick the meal. Me, I didn’t love it. But that’s about brisket. I’ll get back to pot roast. In April, we had dinner at my friend Lauren’s. She made her family’s version. I think it was her grandmother’s recipe. She even had a special roasting pan just for this recipe. It was delicious, so moist and tender. It made me wonder why it was never part of my own mother’s repertoire. So I finally ate pot roast! Still, I had never cooked pot roast. When this week’s recipe for French Fridays with Dorie was selected, boeuf à la mode (aka the great pot roast), I knew the time had come. Dorie’s pot roast involved several steps, but nothing complicated. First of all, you need to plan ahead. The roast and vegetables needs marinate overnight in a bottle of hearty fruity red wine (I chose Merlot). The next day, the roast gets seared, the wine gets reduced, plus, the vegetables get sautéed, and the wine is supplemented with beef broth, anchovies, and tomato paste for a boost of umami in the sauce. Everything goes into a Dutch oven and baked for several hours. This is one of those recipes where I wish technology supported Smell-o-rama. While the pot roast cooked, the house smelled amazing. That same “comfort food” aroma even greeted me for a day or two after the pot roast had cooked. Because the pot roast benefits from a rest, I cooked this in the morning and let it rest for the day before serving it for dinner. 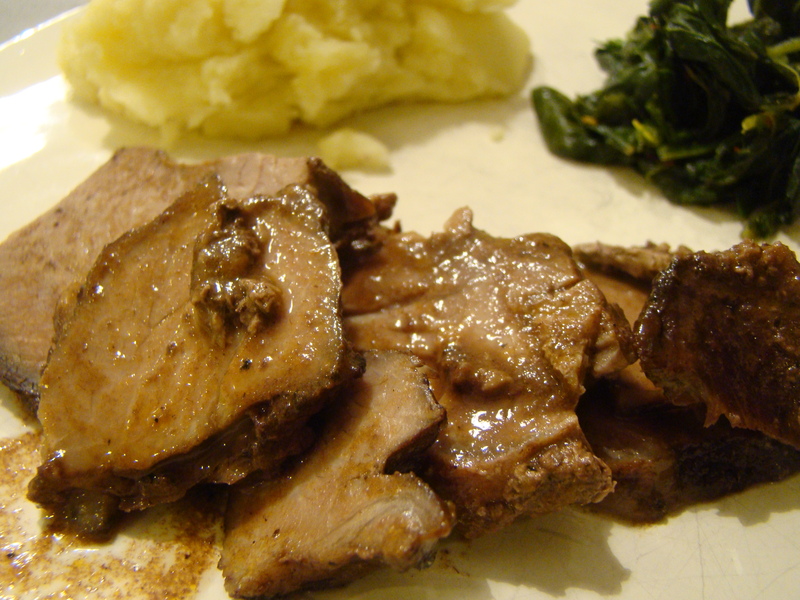 I served my first home-cooked pot roast with the fall’s first batch of mashed potatoes and some sautéed broccoli rabe. Unfortunately, I think I used the wrong cut of meat again. The recipe gave rump roast as an option. We’re still working our way through the quarter of a cow we purchased a while back, so I was able to pull a rump roast from my Mary Poppins freezer (that’s for you, Rose). In the end, even though it seemed fork tender when I pulled it out of the oven, it was dry and a little tough when it came time to serve. The pot roast smelled so appealing and the sauce was so delicious that we were extra disappointed by the texture of the meat. I’m wondering whether a chuck or something else from the front of the cow would have worked out better. I won’t write off this recipe completely. 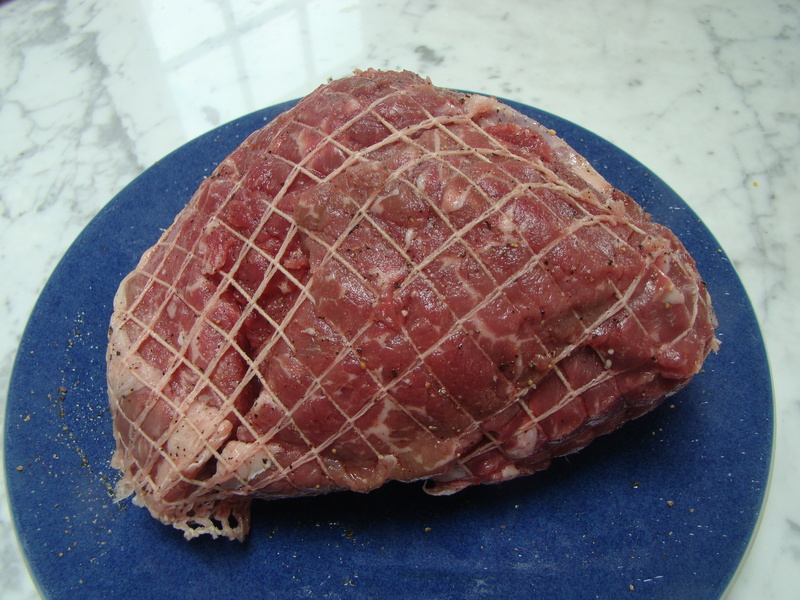 I’m going to ask my friend Lauren which cut of meat she used for her pot roast. I’m thinking that’s the secret to move this into the “loved it” category. 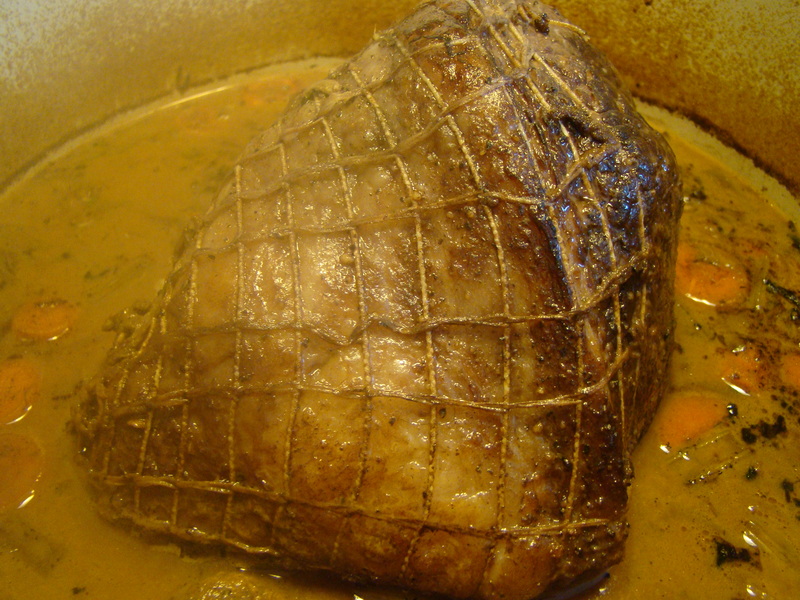 To see whether the other Doristas’ pot roasts were great, check their links here. We don’t post the recipes, but you can find it in Dorie Greenspan’s book Around My French Table.